The specified file public://inline-images/http_%2F%2Fcom.ft_.imagepublish.upp-prod-us.s3.amazonaws_4.jpg could not be moved/copied because no file by that name exists. Please check that you supplied the correct filename. The internal workings of global stock markets are giving a flashing red signal. Cheaply priced stocks have been underperforming richly priced stocks for most of the past 10 years, but the predilection for high flyers has intensified sharply in the past eighteen months. 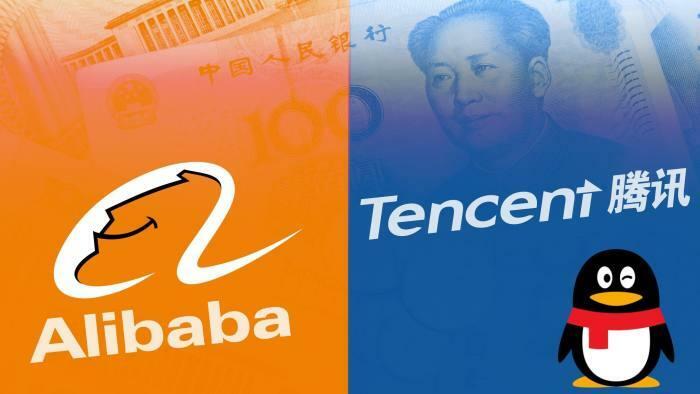 The phenomenon is particularly noticeable in the US and Asian markets, excluding Japan, because of the enormous scale of the Faangs, (Facebook, Apple, Amazon, Netflix, Google) and “Bats” (Baidu, Alibaba, Tencent, Samsung) that dominate their market capitalisation. 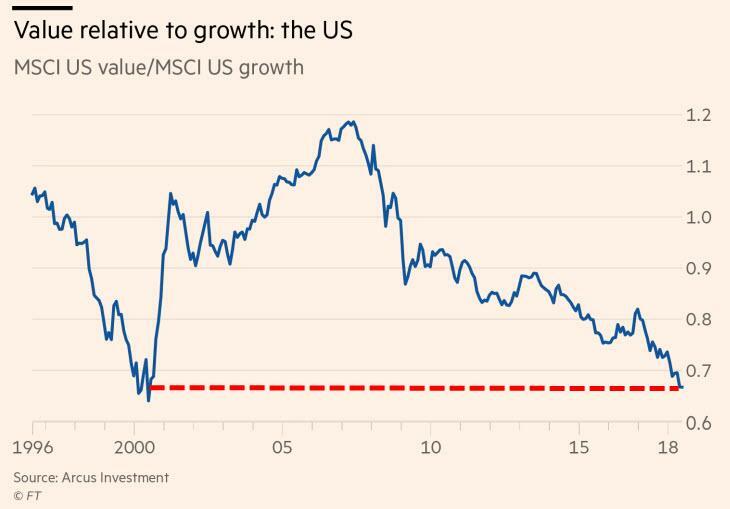 On some measures the gap between unloved value stocks and hot growth ones matches the excesses of the peak of the internet bubble in 2000. Why is this happening? Not because stock markets are becoming more efficient and the value factor has been competed out; if that were the case, the result would be a trendless “random walk” rather than an increasingly precipitous decline in the relative performance of value stocks. Rather, such polarisation is typical of a very late stage bull market. Average stocks of average companies are being shunned in favour of an elite group of stocks that appear immune to economic headwinds and competitive pressures. 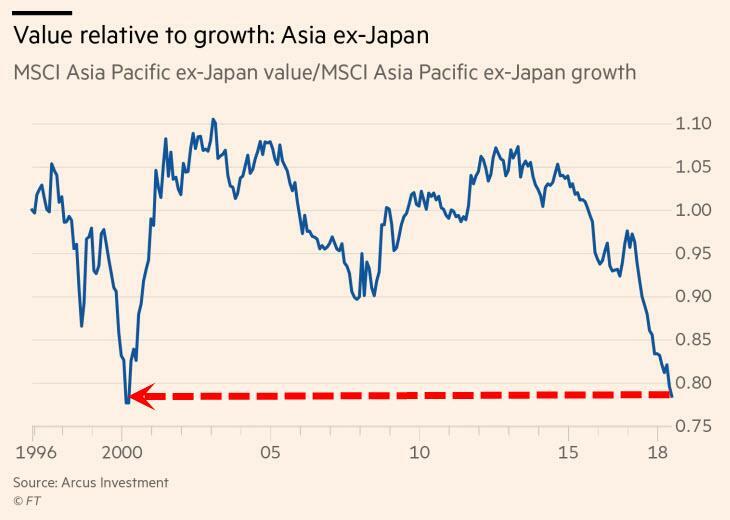 This narrowing of focus is never healthy, especially when the ascent of the chosen few becomes parabolic as investors grow increasingly worried about everything else. MSCI indices of value and growth, which use the single metric of price book value, shows the degree to which the latter has outperformed. It is sometimes argued that book value is no longer meaningful in a world in which companies are increasingly reliant on intellectual property and brand value. Intuitively, that seems possible, but if off-balance sheet assets were indeed making a greater contribution to profits, there should be a structural rise in return on equity. No such rise is visible in either the US or ex-Japan Asia. Indeed, the RoE of the S&P 500 remains well below previous cyclical highs, despite the vast amount of equity that has been retired through share buybacks. Needless to say, there are significant differences between the investment environment at the turn of the century and now. Back then the internet was new and investors had to grapple with a large number of companies with vague and untested business models. Many of the “dotcoms” became “dot bombs”, a few survived and an even smaller number prospered. Of the Faangs and Bats, few were listed companies at the time and some had not even been founded. In today’s world, the tech giants have settled business models and have become part of the daily lives of billions of people. Yet much remains uncertain. What is the sustainable level of profitability for such businesses? Could they end up competing against each other? What are the political and regulatory risks? Most important of all, what is the duration of their business models in a time of constant disruption and technological change? In recent history there have been few cases when periods of severe underperformance by value stocks have ended well for the overall market. One counter-example might be the US market between 1988 and 1991, when value did poorly in the context of a weak US economy and a stock market gradually shaking off the effects of the Black Monday crash. A closer parallel might be the Nifty Fifty mania in the early 1970s in the US. That was also a time of mounting economic stress when it was felt that only exceptional companies were capable of thriving. Of the fifty “one decision” stocks (meaning that you bought them and never sold), several have disappeared off the radar-screen, while others are still with us today. Wharton School Finance Professor Jeremy Siegel revisited the Nifty Fifty in the late 1990s and concluded that their long-term performance as a group was reasonable. Other scholars have revisited Jeremy Siegel and declared the contrary. What is undeniable is that the Nifty Fifty were viciously de-rated in the ensuing 10-year bear market and the worst performers were in the technology sector, including such raves from the grave as Polaroid, Burroughs, Eastman Kodak and DEC. In Thinking, Fast and Slow, Daniel Kahneman discusses how we exaggerate the role of skill and underestimate the role of luck in the rise of a company such as Google. “We believe we understand the past, which implies that the future should also be knowable,” he writes. “But in fact we understand the past less than we believe we do.” The higher the valuation you pay for a stock, the more you are betting on an unknowable future. Value investment, by contrast, is grounded in epistemological humility. Its great apostle was Benjamin Graham, the pioneer of investment analysis and mentor of Warren Buffett. Writing in the shadow of the market meltdown of 1929, he came up with the concept of “the margin of safety,” a bulwark of fundamental value that would limit downside risk. That is the very opposite of “this time it’s different” — story-driven speculation that characterises major market tops. The value philosophy will have its time again — though some harsh lessons may have to be relearned first.